Q: The US tariffs on Chinese goods are due to come into effect on Friday. Can you tell us what preparations the Chinese government has made to ensure there is not too much of an impact on the Chinese economy, specifically to prevent Chinese consumers from feeling an impact or the financial market from being impacted by any economic fallout from these tariffs? A: It goes without saying that the Chinese government has the duty to safeguard our legitimate rights and interests, including those of the Chinese industrial and business community and consumers. 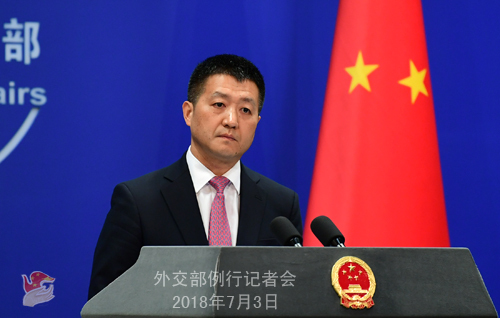 As to the specifics you mentioned, recently the Spokesperson of China's Commerce Ministry has made clear China's position many times and stressed that if the US releases the so-called tariff list, the Chinese side is well prepared and will take all necessary comprehensive measures to resolutely safeguard the interests of our country and people. 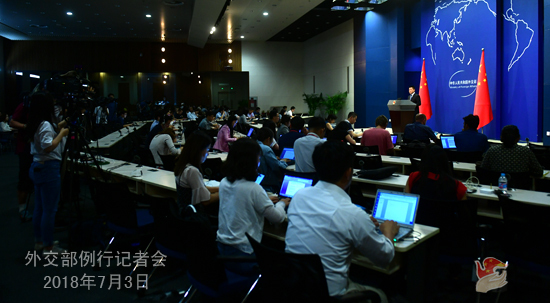 Q: The Forum on Belt and Road Legal Cooperation is held in Beijing from July 2 to 3. Could you give us more details and talk more about the outcomes of the forum? A: The Forum on Belt and Road Legal Cooperation cosponsored by the Chinese Foreign Ministry and the China Law Society was just concluded this morning. The forum issued a joint presidential statement, calling for legal cooperation on the basis of extensive consultation, joint contribution and shared benefits, compliance with and improvement of relevant system of international rules, proactive prevention and proper settlement of disputes, and deepening of the Belt and Road legal exchange and cooperation with a view to provide more solid legal support and institutional safeguard for the Belt and Road Initiative. This forum has drawn high attention as we noted. When addressing the opening ceremony, State Councilor and Foreign Minister Wang Yi said that rules and the rule of law provide the green light for the Belt and Road to go global, as well as the safety valve to cope with risks and challenges. We need to promote infrastructure connectivity and step up synergy of rules and standards under the Belt and Road Initiative. China encourages and supports the Belt and Road legal exchange and cooperation, and will fund the "Research and Study Program for Belt and Road Legal Cooperation". China stands ready to work with other parties to strengthen international legal cooperation and across-the-board cooperation in other fields to promote greater progress of the Belt and Road. Q: The Chinese Embassy in the United States last week issued a travel alert for Chinese citizens, warning them of certain dangers in the US. Was this travel alert issued partly because of the tensions between the two countries? In other words, are there any political motives behind the issuing of this travel alert at this time of tension between the two countries? A: The Chinese Foreign Ministry and its diplomatic missions have the duty and responsibility to timely issue alerts against potential risks Chinese citizens may face in the relevant countries. The summer holiday is the peak season for Chinese citizens to travel to and come from the United States. The Chinese Embassy and consulates are simply fulfilling their duties by issuing such travel alerts. Q: Firstly, the US State Department yesterday said it wishes to reduce Iran's oil exports to zero. To what extent will China cooperate with America here? How will China respond when America sanctions Chinese companies that do not end trade with Iran? Secondly, Trump's lawyer Rudolph Guiliani and National Security Adviser Bolton have been openly calling for regime change in Iran. How does China view such a policy? A: With regard to your first question, China is always opposed to unilateral sanctions and long-arm jurisdiction. China and Iran are friendly countries. We maintain normal exchanges and cooperation within the framework conforming to our respective obligations under the international law. This is beyond reproach. 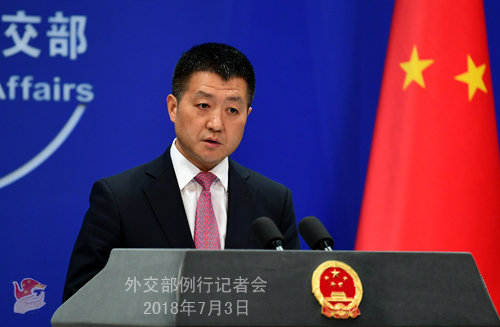 Regarding your second question, China always maintains that countries should develop their relations on the basis of the Five Principles of Peaceful Coexistence, one of which is non-interference in each other's internal affairs. The independence, sovereignty and territorial integrity of one country should be fully respected. A country's political system and development path should only be chosen by its own people. Q: Recently, some US media said that China made Sri Lanka hand over the Hambantota Port to it with "debt trap" and that China harbors military intentions by constructing this port in Sri Lanka. What is your comment? A: The relevant reports, which are a gross distortion of facts, are either irresponsible or engineered by people with ulterior motives. We hope that the relevant media will not be so obsessed with fake news. The construction of the Hambantota Port represents the aspiration of the successive Sri Lankan governments and its people. China encourages the relevant Chinese enterprises to conduct cooperation on this project with Sri Lanka in accordance with the business principles and on the basis of equality and mutual benefit. The Chinese financial institutions, in light of the needs of the Sri Lankan side, provided support for it to bridge the financing gap. With the advancement of the project, China adjusted the assets allocation despite some diffculties according to the wish of the Sri Lankan side. These moves are all conducive to our commercial cooperation. As to the people who fabricated the lie of the so-called "debt trap", if they are unable to offer tangible assistance to the developing countries, they can at least try to put the sincere cooperation between other countries in perspective. I can tell these people that China and Sri Lanka will stay committed to advancing the cooperation on the project of the Hambantota Port in a bid to make Sri Lanka the logistics hub of the Indian Ocean. This will not only fuel the economic growth of Sri Lanka but also contribute to regional connectivity as well as the common prosperity of the regional countries. Q: The US government yesterday said that it was recommending that the China Mobile not be allowed to offer telecommunications services in the US, because they judged the company to be a potential national security risk. Do you have any comment on the decision by the US government? A: The Chinese government always encourages the Chinese enterprises to conduct investment and cooperation while observing market and international rules and laws of the countries they invest in. We urge the relevant US party to discard the outdated cold-war and zero-sum mentality to put the issue in perspective and stop groundless speculations and unreasonable suppression of Chinese companies. They should provide fair and enabling environment for Chinese enterprises' investment and operation in the US and do more to help with the mutual trust and cooperation between China and the US. This serves the common interests of the two countries. Q: US Secretary of State Mike Pompeo is going to the DPRK very soon. What is China's expectation for this visit? A: We have noted the relevant information. The leaders of the US and the DPRK held a successful summit and achieved positive outcomes in Singapore last month. We hope the US and the DPRK will continue to meet each other halfway and express goodwill to each other, earnestly implement the consensus reached by the two leaders and move forward the follow-up negotiations. Q: According to reports, 12 young Thai soccer players and one coach who had gone missing on June 23 were found by rescuers yesterday. They are all alive with normal vital signs. We noted that the Chinese non-governmental rescue teams voluntarily participated in the relevant search and rescue activities. What is your comment? A: As a close and friendly neighbor of Thailand, the Chinese side has been worrying about the safety of the missing from the very first day. We are relieved by the news that the search and rescue efforts have made important headways and the missing ones have all been found with normal vital signs. You said that the Chinese non-governmental rescue teams voluntarily assisted in the relevant search and rescue efforts. I believe that it just testifies to one Chinese saying that "when trouble occurs at one spot, help comes from all quarters" and showcases the fact that China and Thailand are as close as family members. We hope that the boys and their coach can be rescued as soon as possible and wish them a speedy recovery. Q: With regards to the sound waves incident, in its communications with the Chinese government, has the US government said whether it suspects a third-party government may be behind the phenomenon? What is the Chinese side doing to help the US side investigate? A: We have answered relevant questions before. The relevant Chinese departments have carried out investigations, yet found no cause or clue that may have led to what was reported by the US side. Like we said previously, the US could provide more details to the Chinese side if they have, and the relevant Chinese party is willing to stay in close communication with the US side.